Rocky Vista University (RVU) took part in a simulation exercise called “Operation Follow Through,” alongside local police departments, fire stations, and other emergency responders. 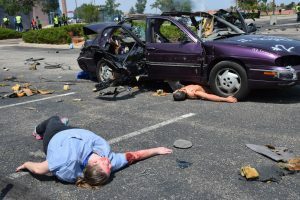 The simulation, set up to resemble a series of detonated car bombs, was planned to assist in training in every part of a disaster: from the initial police officers on the scene, to the paramedics, and finally to the hospital’s emergency room. The mass casualty incident took place over the course of three days in the Inverness area of Centennial in an office building parking lot. Several cars (which had previously been detonated in a controlled environment) were placed around the parking lot amid smoke machines. Victims—many of whom were second-year medical students at RVU—with simulated injuries and wounds lay about, screaming and crying for help. Deidre McGee, Coordinator for Surgical Simulation and the Military Track at RVU, led the moulage team that created the injuries. 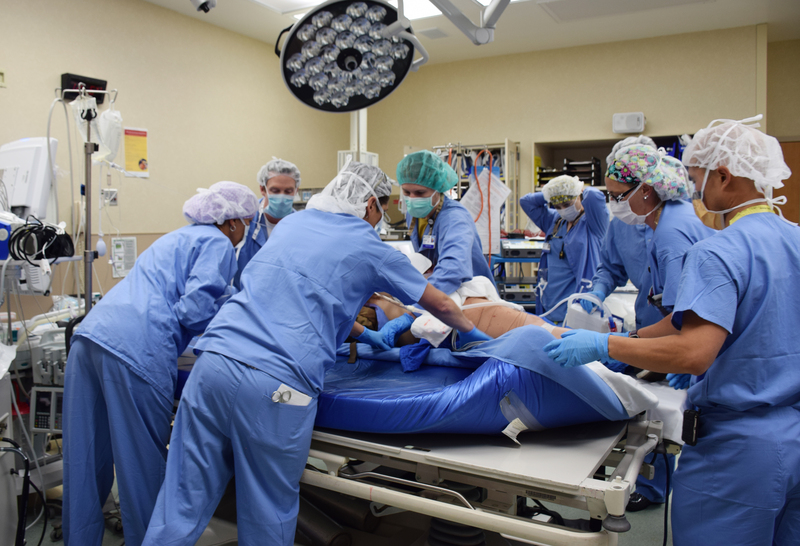 Many victims also wore RVU’s cut suits, which are human-worn simulators that allow surgery and other procedures to be performed in a realistic way which further heightens the stress of the situation. After clearing the scene of immediate danger, police officers began helping the victims until the paramedics arrived. After being loaded into ambulances, victims were taken to Sky Ridge Medical Center (SRMC). They were then brought into the emergency room to continue the training scenario with a complete surgery. 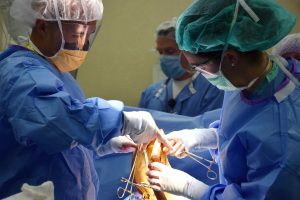 The surgeries were performed by residents of the joint Rocky Vista University and Sky Ridge Medical Center Surgery Residency Program. Additional agencies involved included Douglas County Sheriff, Jefferson County Sheriff, Arapahoe County Sheriff, Action Care Ambulance, Cunningham Fire Rescue, Franktown Fire District, and the Federal Bureau of Investigation.